The Accord Group is dedicated to meeting need, whether that be housing need, employment need, health need or whatever need. It is made up of seven organisations that provide 11,000 affordable homes and services, including health and social care, to 50,000 people across the Midlands and beyond. A not-for-profit organisation, it has 4,200 employees and an annual turnover, including new developments, of about £100 million. The rise of the Accord Group is a remarkable success story. 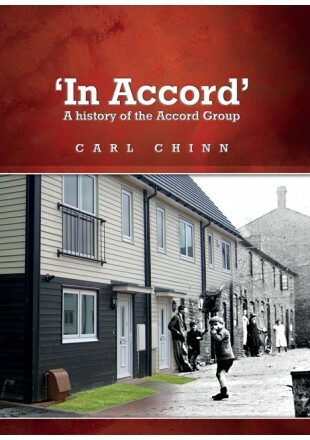 'In Accord' explores that story and those of the Groups' partners: Ashram Housing Association, bchs, Caldmoreaccord Housing Association, Direct Health, Fry Housing Trust, Moseley & District and Redditch Co-operative Homes. Through the words of some of those who have contributed so much to the battle for social justice, empowerment and inclusiveness, 'In Accord' traces the origins of the Accord Group to the response to the crisis of homelessness in the 1960s. It takes the story on through the developments of the 1970s, the rapid growth of the 1980s and 1990s and on to its position today as one of the largest housing and social care organisations in the Midlands. Yet for all the significant growth in size and responsibilities of the progressive Accord Group two constants remain: the desire to strive for social justice and the conviction to give tenants a meaningful voice.